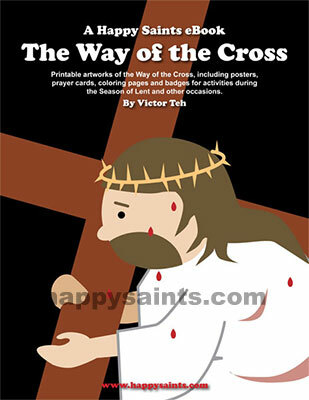 This PDF ebook features printable artworks of the 14 Stations of the Cross, including posters, prayer cards, coloring pages and badges for activities during the Season of Lent and other occasions. Hello! love your work immensely. Thank you for everything. I would like to draw your attention to a typo on Station 13. The title of Thirteenth is spelled incorrectly. Thanks! Also, a request for Marian apparitions and other marian art in an email! Hi Bern, thank you for pointing out the typo. It happens on the coloring page, I see. I have amended the ebook and uploaded it. Please send me an email to victorteh(a)yahoo.com if you wish to download the updated ebook. Do you have any material in Spanish? I would love to use your material in our Spanish RE/Catechism programs!